Get ready to Ride! Don't worry, I made that tagline up on my own, they didn't actually use that. 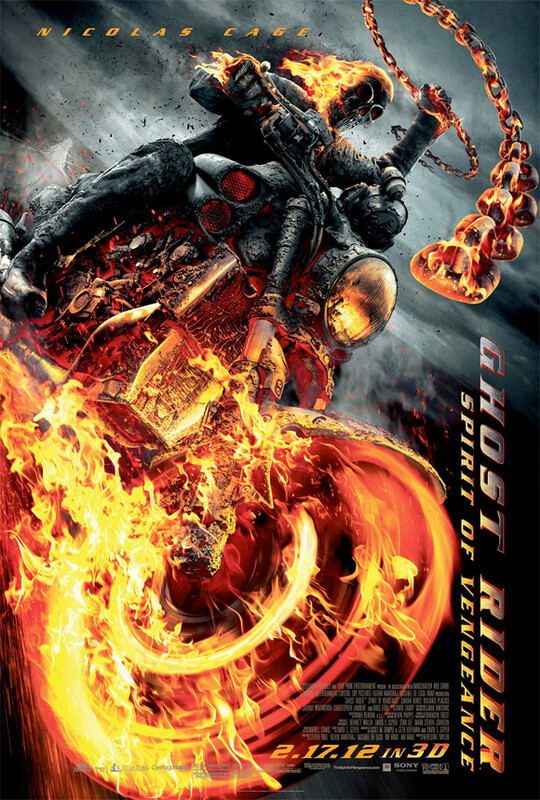 Columbia Pictures has unveiled in high res the final official poster (via SuperHeroHype) for Ghost Rider: Spirit of Vengeance, seen below, along with the finalists in their poster design contest. Many readers have sent in photos of the final poster, as it's also a giant cardboard display seen in most movie theaters right now. As for these fan posters, I actually think some of these look better than the official one, at least the hand-drawn artwork. I'm still looking forward to seeing this, even though it got some dismal buzz at a recent screening. 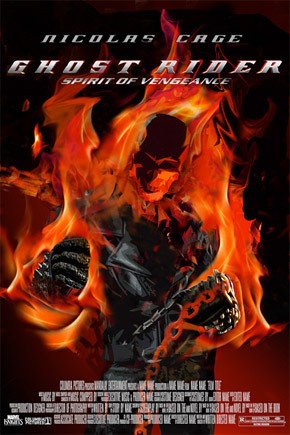 Here's the final poster artwork for Neveldine/Taylor's Ghost Rider: Spirit of Vengeance, being shown in 3D. And here are the Face of the Fan poster design contest finalists for Spirit of Vengeance. These are the six chosen, as listed on the voting website. There is one more round of voting to determine the ultimate winner. 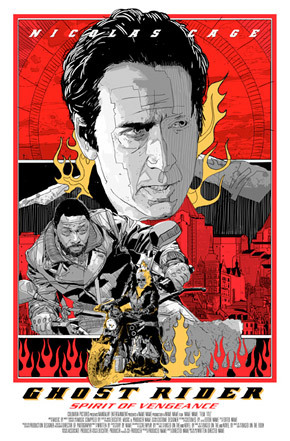 As seen in the first official trailer released in August for Ghost Rider: Spirit of Vengeance, Nicolas Cage returns and stars with Idris Elba, Ciarán Hinds as the Devil, and Johnny Whitworth as the villain Blackout. 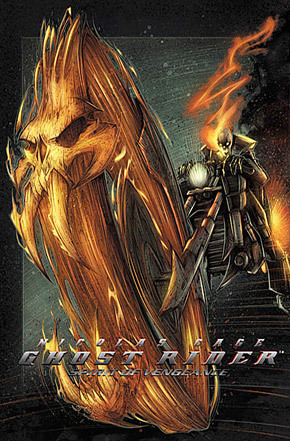 "This version, we wanted to give people what we think comic book fans really want to see with Ghost Rider. It is darker and more intense. He is from a nightmare. He will scare the hell out of you," director Brian Taylor told Collider at Comic-Con. The story was conceived by David S. Goyer, with a screenplay by Scott M. Gimple & Seth Hoffman. 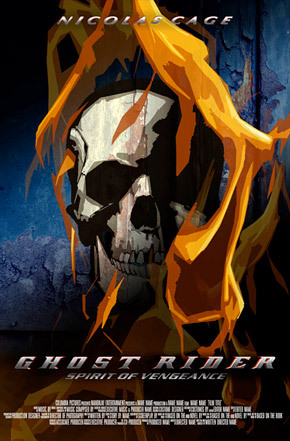 Columbia is opening Ghost Rider: Spirit of Vengeance in theaters in 3D starting February 17th, 2012 early next year. I can't wait to see more, this looks awesome! I like the profile pic. I know it wouldn't be used for actual posters, but the art is dope. These posters make me even more stoked for the movie! 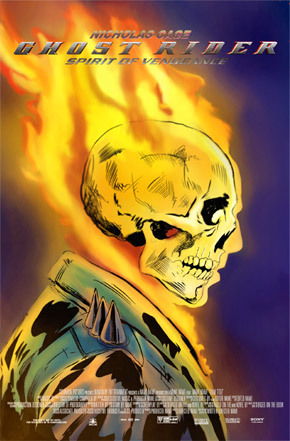 I'm a big fan of the new look of Ghost Rider with the charkle burnt look to his leather suit and bike. I like the fourth and fifth one. This is how you get people to see a movie. Make these the official posters. These posters are what ART is all about. Awesome!! 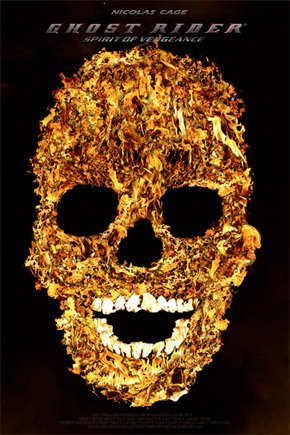 First impressions are the Ghost Rider sequel makes the first one look like a masterpiece. ADD THE RELEASE DATE AS SINGLE NUMBERS AND IT EQUALS TO 13...COINCIDENCE...? ?WHAT THEY DON'T WANT YOU TO KNOW! !